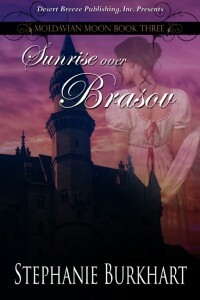 Much different from any historical or paranormal book I’ve read, Sunrise Over Brasov was both exciting and terribly romantic. It’s not a regency historical … taking place far outside the ballrooms with which I’ve been acquainted. And the story is filled with paranormal beings of all types, from shifters to vampires to witches. Yet, Ms. Burkhart makes it all seamless. I need to point out that this is the third in a series, and I’ve read none of the others, but was only a teeny bit lost now and then. The author does an admirable job of filling in the backstory without being dull. The story is heavy on the mystery/suspense part with a curse and mayhem, bad guys blowing things up and chasing our heroine and her friend and more. There is mistrust and sadness (Rosa has been given drugs to erase her memory, and so has forgotten the man who loves her). The author writes her descriptions with a wonderful skill, painting a clear picture with her words. I loved how unusual her story, characters and setting were. This wasn’t the same old werewolf story. I was intrigued by her take on things. Since I read primarily for romance, I was a bit frustrated by how it took backseat frequently to the storyline itself. I was really invested in Rosa and Michael, and wanted to see more of them together. Still, ultimately, their story made my heart happy and that’s all I can ask. Now I need to go back and read the first books … I want to see how everything began!